This recording of Taneyev’s Quartets Nos. 2 and 6 comes hard on the heels of a complete cycle from the Carpe Diem String Quartet on Naxos. In fact, the California String Quartet made their recordings in 2014–15, immediately before the release of the Carpe Diem’s Sixth, which perhaps accounts for the new one being delayed until now. But it was worth the wait, as these are excellent performances, and the California String Quartet clearly has something new to say. Prior to the Carpe Diem cycle, the only commercial recording of these works was a complete cycle by the Taneyev Quartet, recorded in Leningrad in the late 70s, and reissued on the Northern Flowers label in 2005. The Taneyevs and the Carpe Diem take contrasting approaches to the music: the former broad, expansive, and Romantic, the latter brisker and more focused. The California String Quartet sits somewhere in between, leaning closer to the Carpe Diems, but generally adopting broader tempos and a warmer tone. All the different versions are recorded in good sound—some noise reduction on the Taneyev Quartet cycle gives an artificial rounded quality to the sound, but it’s good for its age and provenance. Taneyev’s music is often highly contrapuntal, so detail is required, especially from the viola and cello. Although the lower instruments are presented in excellent detail on the Carpe Diem release, this new version offers even greater clarity, with a wide stereo separation—viola and cello on the right—and the viola (Zach Dellinger) particularly prominent when required. Taneyev also makes heavy demands on the violins, who are often required to play with a weighty, broad tone, even in the highest registers. The Taneyev Quartet manage this better than either of the more recent competitors, but the sweetness of tone and blend of ensemble that the California Quartet brings to the tuttis is compelling too, a more approachable and involving sound, if not quite as dramatic. The California Quartet also takes a stricter approach to phrasing than the Taneyevs, with phrase endings sometimes sounding clipped, at least by comparison. The exception is the Adagio third movement of the Second Quartet, which really benefits in the California reading from their combination of long, flowing phrases, and rich, well-sustained sonorities. The California Quartet also gives the most convincing reading of the Scherzo second movement. It’s the slowest of the three accounts, but the clean, precise textures and the incisive accents make it the most dynamic-sounding and vibrant. 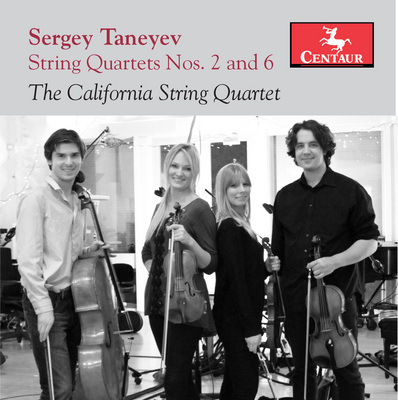 The Sixth Quartet is Taneyev’s last work in the form (Nos. 7–9 predate No. 1 and were published after his death), and after the Second is the most accomplished of the cycle. Although of a similar length, it’s not as expansive or symphonic as the Second, so the California Quartet’s dynamic approach proves ideal. My generalization about tempos doesn’t hold for every movement here: Of the three accounts, the California Quartet gives the slowest accounts of the first, third, and fourth movements and the fastest of the second. In comparison to the later accounts, the Taneyev Quartet’s Adagio serioso second movement is a real outlier, a minute and a half longer than either of the others, but the California Quartet demonstrates that a brisker tempo is ideal. This movement is the highlight of the quartet, with a stately pavane-like melody over a steady walking bass, much like the passacaglia movements in many of Taneyev’s other works. It is given real shape by the California Quartet, and not just through the faster tempo, but also the more disciplined phrasing and unity of ensemble. This new account from the California String Quartet can be easily recommended as a first choice for both works. All three accounts are worth hearing though, and the Taneyev Quartet in particular brings different qualities to the music: Taneyev balances Baroque counterpoint against Romantic expression, and while the California and Carpe Diem bring out the former, the Taneyev Quartet clearly inhabit that Russian Romanticism in a way their American successors don’t. Perhaps the California Quartet are planning a full cycle of their own, which would certainly be welcome. But even if it doesn’t happen, they have done Taneyev’s fans a favor by coupling his two finest string quartets together for the first time, and in readings that consistently match, and often exceed, the competition. Jaap van Zweden’s Hong Kong Ring cycle continues apace, a flagship project for Naxos and a boost too for the Hong Kong Philharmonic’s international standing. When the project was launched, with Rheingold in 2013, it was a victim of bad timing, coinciding with a far superior version, also from concert performances, from Simon Rattle and the Bavarian Radio Symphony (BR Klassik 900133). But no cycle followed from Munich, and since then, Ring recordings have been few, at least audio versions. The Naxos cycle also has an almost unique selling point of being in high-definition surround sound—in Blu-ray audio, the preferred format of Naxos over SACD—and the results fully justify the technology. The interpretation and casting are good, although neither stands comparison with the historical best, and views on the lead singers are likely to come down to personal taste. Everything about this performance speaks of careful preparation and investment of time. German opera house orchestras have dominated the recent Ring discography, especially on DVD, but the Hong Kong Philharmonic is clearly a different ensemble. They don’t have the burnished string tone or the warmth from the woodwinds of a Central European Ensemble, though the brightness and clarity they offer instead is a bonus, even if it leads to a slight sense of detachment from the drama. The string sound, while usually secure in ensemble, can be thin, especially with the violins in the top register, leading to a transparency in the tutti textures—impressively clear but occasionally uninvolving. Zweden, for his part, gives a measured but fluid reading. Tempos are generally mid-range to slow, though he always builds impressively to climaxes. He communicates well with the singers, offering generous supporting textures, but also reigning in any rubato excesses. All round, a real ensemble performance then, meticulously prepared and well presented. The cast is a curious mix of Wagner veterans, relatively new names, and, in the case of Matthias Goerne’s Wanderer, a Lieder singer branching out into pastures new. In fact, Goerne has a reasonable track record with Wagner, having sung Wolfram, Amfortas, and Kurnewal onstage, but he still sounds like a Leider recitalist seeking for the vocal weight and dramatic presence required to bring the role off. His sound is more volume than heft, big on character but lacking in gravitas, and with a hazy quality that you either love or hate. His diction is excellent though, and he fits well into the ensemble. 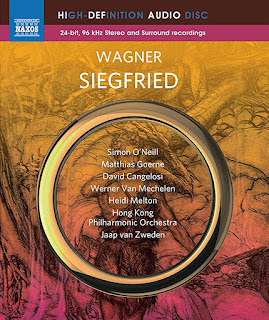 Simon O’Neill is a similar case as Siegfried. For all his undeniable musical qualities, the most apparent trait—or flaw, depending on your perspective—is his plumy English accent (though he is actually a New Zealander). He is a very lyrical Siegfried, too lyrical perhaps, as he often sounds Italianate in his rounded, florid phrasing. But he has plenty of Wagner on disc already, so buyers will know where they stand. The rest of the cast is less controversial and generally very fine. David Cangelosi is an articulate Mime, mildly sinister and certainly not caricatured. Werner Van Mechelen is a little hollow-sounding as Alberich, but hardly to a fault. Falk Struckmann probably counts as luxury casting here as Fafner. He is not as profundo as some, but he’s still ominous. Deborah Humble has a very young-sounding voice for Erde, and struggles with some of the lower notes. She has a heavy vibrato too, that sometimes sounds labored. Brünnhilde isn’t a huge role in this opera, but Heidi Melton makes the most of it. Her tone is a little thin at the top, but all the notes are there, and she and Simon O’Neill bring the third act to a suitable passionate conclusion. The surround sound is involving, though it does the orchestra more favors than the cast. By accident or design, the anvil in the Prelude appears at the back left of the soundstage, just as the libretto specifies. There are some thunder effects, which seem pasted on, though they probably worked better live. The timpani dominates the center channel and sounds more closely miked than most of the orchestra. The singers occasionally seem distant: Siegfried, for example, seems to begin offstage, coming towards the microphone for his first entry, and, as the Forest Bird, Valentina Farcas, seems to be positioned behind the orchestra or in some other remote spot stage left. She sings well, but the recording doesn’t do her justice. The orchestra, however, is afforded a spacious setting, all the more welcome given that most DVDs of staged Wagner operas don’t explore their surround sound capabilities for the back of the pit. The Hong Kong Cultural Centre Concert Hall seems to have a fairly dry acoustic, so there isn’t much going on in the rear speakers. An impressive, if not exceptional, Siegfried then, from Jaap van Zweden and his Hong Kong forces. 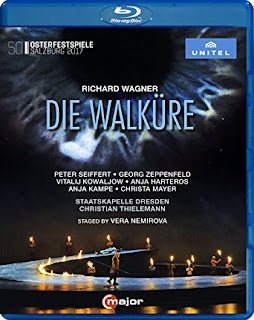 Unless you’re a diehard Goerne fan, you’re unlikely to seek it out for the cast, but Zweden’s detailed reading, along with the quality of the orchestral playing and the audio elevate the project, and auger well for the Götterdämmerung to come. 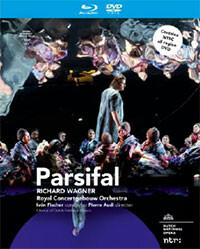 Pierre Audi’s Parsifal was clearly a big event for Dutch National Opera when it premiered in 2012. This video was made during that first run, and its release now coincides with a revival of the production in Amsterdam, and with Audi’s departure from the company; in 2018 he takes over as artistic director of the Aix en Provence Festival. The set for the opening of the first act is a collection of what seem like rocky outcrops. When we come to the Grail Ritual, these rotate to reveal the Grail Knights on wooden scaffold platforms. The earthiness of this scenario, combined with the almost total absence of Christian symbolism, suggests a Pantheist angle. The second act is more arresting visually, with a huge reflective sphere suspended at the back of the stage. Distorted reflections follow the Flower Maidens, Parsifal, and Kundry about, and even the conductor is clearly visible, but, elegant as it is, the significance is never made clear. In the final act, a circular hole in the backdrop takes the place of the sphere, suggesting absence and emptiness at Montsalvat. And indeed the ending of this production is uncompromisingly bleak—after two and a half acts in which religious imagery has been completely absent, the Grail Knights now appear, each with a black crucifix painted on their face, and, although Parsifal accepts the spear and heals Amfortas, the assembled company all eventually wither to the ground, as if in death. It’s a curious ending, and all the more pessimistic for being the only significant directorial intervention in the entire production. A cursory glance at the box cover suggests that the production features Klaus Florian Vogt as Parsifal, but a closer look reveals it to be Christopher Ventris. He has a weightier tone than Vogt, closer to Peter Sieffert, perhaps, whom he also resembles. Ventris is a competent Parsifal, and has the stamina to see it through, but his voice lacks the character required to make his long narrations memorable. Similarly Falk Struckmann as Gurnemanz, another dependable Wagnerian, though getting on in years, but he too has the stamina for the role. Perhaps both singers can be forgiven for not giving memorable characterizations in a production so notably low on Personenregie. That said, Petra Lang excels as Kundry, here consolidating her reputation as the Wagnerian mezzo du jour. She has an uneasy stage presence, always unsettling the quasi-mystical discourse, even when she is not involved—just the sort of singer a production like this needs. She is in fine voice too, her singing dramatically engaged and always attractive, even at her most bitter and vitriolic. Mikhail Petrenko is luxury casting for Titurel and Klingsor, though the production does little to highlight either character, with Klingsor in particular seeming like an imposter in his own castle. The Royal Concertgebouw Orchestra has a long and proud tradition of Wagner performance, and the players’ affinity with the music is a real asset here, although this appears to the only complete performance of Parsifal the orchestra currently has in the catalog. Iván Fischer is less associated with Wagner than is his brother, Ádám, but he has an excellent feeling for the music’s drama and scale. Many conductors linger over this score, so it is refreshing to hear Fischer taking brisker tempos, and only very rarely to the detriment of the music’s atmosphere. That upbeat approach also suits the visual style, and the combined efficiency of music and spectacle affords valuable dramatic coherence. The package includes DVD and Blu-ray discs: Sound and image are good on both, with the Blu-ray notably superior, especially in image. Microphones are positioned at the front of the stage, but so too is most of the action, so the singers rarely sound distant. The camera work mixes close-ups with wide angle, and impressively captures the scale of the second act setting. The set is released on the small Dutch label Challenge Classics, and seems to be the first and only video in the company’s catalog. But their many audio releases always have high production standards, and they have a commitment to the SACD format. Given the excellent production standards here, here’s hoping they have further collaborations with Dutch National Opera in the works.